When the Neo Geo AES hit the scene 20 years ago, it was one of the largest, most powerful and most expensive game consoles the market had to offer, ringing in at a steep $650. Used AES machines aren't much cheaper, and modernized slim variations don't cost a penny less than the original hardware, either. 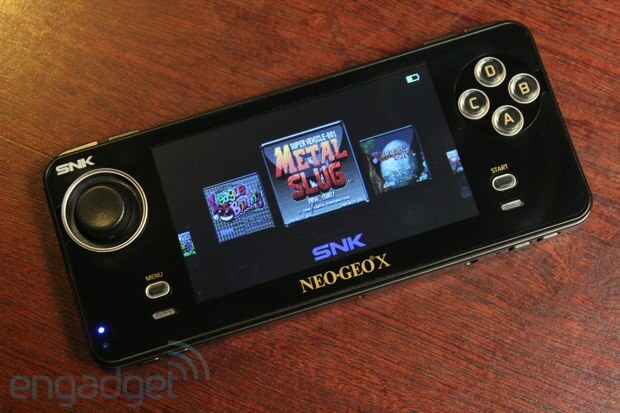 A full home console might be a bit outside of the average gamer's budget, but SNK's 20th anniversary Neo Geo X hits a little closer to home: $200 for a portable handheld, 20 pre-loaded games, a faithful recreation of the original console arcade stick and an AES-shaped charging / controller dock that pipes video and audio out to a proper television. The end result? A handheld dressed up in a home console's skin. This is something we needed to see -- we spent some time with the setup to give it a once over. 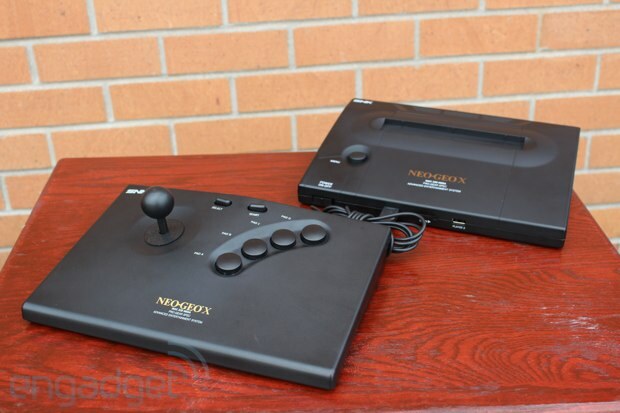 The Neo Geo X Gold bundle consists of a handheld, a dock, an arcade stick and a Neo Geo X game card -- a package that's certainly greater than than sum of its parts. Combined, these pieces create a functional facsimile of a home game console, but the brain of the operation lives in the portable Neo Geo X itself. It's a handsome piece of kit, featuring a 4.3-inch LCD screen flanked by four face buttons on the right, and an 8-direction d-pad on the left. A menu and start toggle sit on either side of the screen, too, as do a pair of speakers. More controls line the device's metallic edge, including brightness and volume controls, four shoulder buttons, power, a headphone jack and a game card slot. A rubberized back pad tops the hardware off, spelling out SNK in metallic letters. The device is a bit too long to fit comfortably in a pocket, but sat nicely in this editor's large hands. The machine takes a minute to boot up, as do each of its games -- slowly running through the classic Neo Geo start up animation before popping up simple game menu. The machine's d-pad is a bit of an odd input. It looks like analog thumbstick, but isn't -- each of its eight directions registers with a physical and audible click. At first, navigating the handheld's menu, this feels awkward and clunky, but the very second you get into a game, it feels right. It doesn't take long to realize this light tactile response is mimicking the feel of the classic SNK arcade stick. It's satisfying, but can feel a bit strange to gamers who've grown accustomed to the smooth analog nubs that modern handhelds have to offer. The face buttons are nice, too, featuring a soft landing that's still firm enough to avoid being called "mushy." The Gold bundle also comes with an AES-style arcade stick, albeit a smaller, USB connected one. We were told the miniaturized controller is being built with the same parts as the original, and it certainly felt like it -- featuring the same 8-switch Joystick and large, friendly buttons as the classic model. It felt nice under our palms, but sadly, we didn't have a chance to use it in a game. We spent a few minutes storming through the first level of Metal Slug, and felt right at home. Games seem to run flawlessly, featuring no obvious compatibility issues -- though the firmware on the device leaves a little to be desired. Clicking the menu in game gives you the option to return to the title select screen, but the handheld won't save your place. Closing out any one game is like hitting the reset button -- there is no multitasking on the Neo Geo X. Then again, it's just a glorified file selector. It's hard to complain. Perhaps we're just spoiled by contemporary portables. When housed in its docking station, the Neo Geo X is a dead ringer for the AES, accurately copying the original console's design in a compact and attractive package. There are a few modern tweaks, of course -- the original hardware's reset button now functions as a menu key, and the once-proprietary controller ports have been swapped out for USB. Sadly, the cartridge slot didn't get the modern makeover, game cards need to be installed directly in the handheld, and the case offers no backwards compatibility for your old AES games. The dock's build seems a little lightweight and flimsy compared to the premium feel of the handheld, but it has quality where it counts: a reassuringly soft, pseudo-plush bed for the docked device, headlined by the necessary charging, HDMI and audio ports. Slide the console in, close the lid, and you've got yourself a miniature Neo Geo AES. The complete Neo Geo X Gold limited edition will cost $200 when it lands this December, but the standalone handheld can be had for $130. It isn't the cheapest handheld on the market today, or even the most technically capable in its price range -- but as a trip down memory lane for Neo Geo fans, it's hard to beat. The complete set offers not only a solid collection of classic games, but a novel and modular retro experience. If Neo Geo continues to release additional game cards, they could have a winner on their hands, at least for gamers with fond memories of the 90s.